Crist led the charge on a program called Cover Florida which offers accessible health care coverage to Floridians. It isn’t the best program but it was better than what existed prior. The same argument can now be made for the healthcare reform bill that recently passed nationally – though Florida’s plan does not require taxes to pay for the program. Crist was against off-shore oil drilling – until he sought the vice presidential bid with John McCain. Yes, it was Crist (a Republican) who famously hugged (Democrat) Obama after introducing him in support of the stimulus plan. Crist is still taking a beating over this and that may have been the beginning of the end for him in the Republican primary. Even though he was ripped for supporting the stimulus package, the state will end up doing nicely as much federal money will come into the state providing jobs – creating a bullet train connecting Florida’s largest cities (Orlando, Tampa, Jacksonville and Miami) and a huge construction job recently broke ground in Ft. Lauderdale as they expand I-595. Crist stood up to State Farm after they requested a 47% rate hike. Last August, Crist called Florida Power & Light’s proposed $1.3 billion rate hike ‘excessive’. As Florida Attorney General Crist got FPL to freeze its electricity rate. Crist consistently puts Floridians first and many Floridians are aware of it. One of Crist’s problems is that as a Republican, he is forced to run to the right in order to garner more conservative support. The problem is that his main primary challenger, Marco Rubio is about as far right as they come. There has been a ton of speculation that Crist would abandon the Republican Party to run as an Independent. Again, I said this was his only option many months ago and still see him having a strong chance of winning in this scenario. Many pollsters have indicated that it would be an uphill battle for Crist and I disagree. True, he would lose all of his far right Republican support but he lost them already. Marco Rubio is 38 years old. He’s dynamic and likeable. He’s very conservative. And he’s never hugged President Obama. Florida Republican hero Jeb Bush supports Rubio. 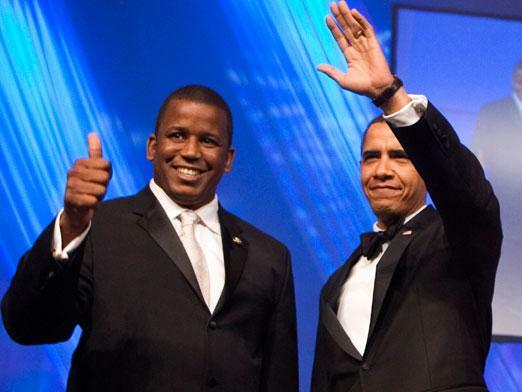 He is one of the Republican Party’s brightest stars and could see the White House in his future. The biggest uphill battle Crist would face either as a Republican primary challenge or if he runs as an Independent is the Republican Party machine will be fully behind Rubio. Crist has a habit of running more conservative than he is. One of the reasons I didn’t vote for him in 2006 was that he promised to continue the status quo from the conservative Jeb Bush administration. 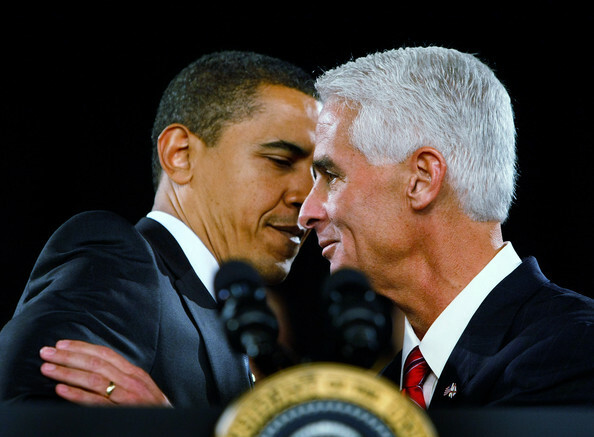 In this case however, Crist will not be able to out conservative Rubio – especially with ‘the hug’ hanging over his head. He really needed to continue to run on his record – not just as governor but as attorney general. Pretending to be a far right conservative doesn’t play well especially since his main competition is the poster child for far right conservatism. It was clear from the get-go that Rubio was going to get Teabagger (formerly known as NeoCon) support. 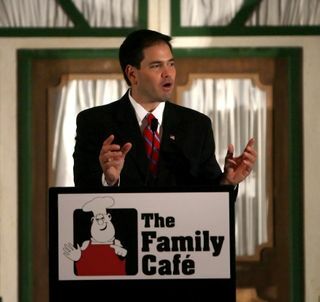 Rove, Jeb and Cheney have already come out in support of Rubio. McCain (formerly known as McBush) is currently supporting Crist as he was an integral component of McCain winning in Florida in the 2008 Republican primary. McCain has indicated that he will drop his support is Crist leaves the Republican Party. McCain is dealing with a similar challenge in his Arizona reelection bid – a Teabagger challenge. Because of Crist’s veto of SB6, former U.S. Senator Connie Mack resigned as Crist’s campaign chair. A miracle is the only thing that could save Crist in the Republican primary now. Could the miracle come in the form of an Internal Revenue Service investigation into Rubio’s tax records while he was Florida Speaker? Possible but I highly doubt that it will derail his momentum. Leading Democratic candidate Kendrick Meek currently represents Florida’s 17th district in South Florida. He’s a likeable guy with more personality than senior Florida Senator Bill Nelson (D). In a regular year, he’d have a great chance to win but this year is unusual as the Republicans are running 2 of their strongest candidates in a knockout of an election. Meek has served in Congress since 2003 when he replaced his mother who retired after serving 5 terms. We’ll delve more into Meek as the election cycle gets closer. 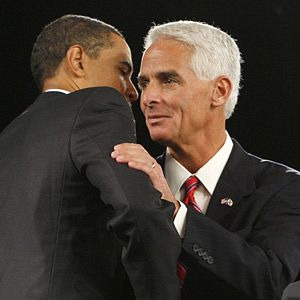 In order for Crist to pull out this victory – barring any Rubio scandals – is for Crist to leave the Republican Party. Between the Teabaggers and those who get all of their news from Fox and Rush there is little left for the Crist crowd. Crist is still popular with the moderate Republicans, Independents and moderate Democrats. If he runs as an Independent, this would become a 3-person race. Rubio would be assured of about 38% of the vote and Meek would be assured of 25%. That would leave about 37% for Crist. Of course, since Meek is the least known of the 3 candidates today, he can only gain in popularity especially if the Democrats put money behind him. As a result, Meek would only need to pull in an additional 14% from Crist which considering Crist’s base is entirely doable – especially if Rubio continues to pound Crist in ads until November. Depending what happens where Teabagger meets moderate and moderate meets liberal will determine who wins this race. Another option is that Crist had gone out on a limb for Obama’s stimulus plan. The return favor could be a replay of NY-23 where Meek drops out of the race and supports Crist. This would also be exactly what happened in Connecticut when Joe Lieberman lost his Democratic primary only to become an independent. The Republicans essentially put their support behind Lieberman catapulting him to victory. Clearly not unprecedented, we could conceivably see this especially if the polls indicate that Meek has absolutely no chance of winning. It is doubtful to find a Democrat who would support Marco Rubio over Charlie Crist especially those within the Democratic Party machine. Crist’s last option is to withdraw altogether and come back in 2 years to challenge Bill Nelson for his senate seat. Based on what we know today, the only Republican that could stop Crist in 2 years would be Jeb Bush and in that time, Bush may change his mind and run. It would be interesting to see if Crist changes to Independent, drops out of the Senate race and runs instead for reelection as an Independent against a very weak Bill McCollum (R) and Florida CFO Alex Sink. He could win this race but he would come out looking very foolish and indecisive. This Senate race is far from over for Crist though the Republican primary is finished. It’s clear that Crist is seriously considering leaving the party as his comments on the subject went from definitively staying a Republican to wishy-washy (‘things change’). The Rubio campaign pointed out that Crist had pulled his television ads which is a sure sign that something is up. And obviously he has sent out feelers based on some of the comments we heard from his supporters (soon to be former supporters). His veto of SB 6 also sends a message that he intends on running a moderate campaign in the future because Crist’s past supports that he would have signed this bill as it would have demonstrated that he was a conservative. Crist’s campaign has indicated that he will make his decision by Thursday which is the deadline to switch. If he chooses not to abandon the party that clearly doesn’t want him any longer, does he opt to withdraw from the race altogether? It seems the hardest thing for a candidate to hear is that it’s over. Only time will tell but the noise keeps getting louder. The Florida Senate race is living up to its hype and it looks to get more exciting if Crist leaves the party and stays in the race and Kendrick Meek joins the story. Meanwhile, the Florida Governor’s race is as dull as can be. Maybe Crist should have run for reelection and gone after Nelson’s seat in 2 years. One thing is sure – Crist should have changed parties long ago. This entry was posted in Barack Obama, Democrats, Politics, Republicans and tagged Charlie Crist, Florida, Kendrick Meek, Marco Rubio, US Senate. Bookmark the permalink. Pleased to see that you are still posting local, Florida politics. This year is another important election year. I’m gearing up to attack the Republican trash that is running for office in PA.
Cats, It’s really great to hear from you. This election year is going to be huge. I’ve been relatively quiet lately thanks to my job and kids going off to college, but I hope to pick it up for the election cycle. I do post regularly on Twitter so I don’t lose my passion. I’ll look forward to conversing with you.